As I enter the gallery, Keith Varadi and Spencer Longo are putting the finishing touches on an installation. Tomorrow will be difficult as 6000 stickers need to be stuck on the floor. Gallery 2. If you enter a room and you think you are going to find a show you are right. Or maybe not. Varadi asked to build a wall with a window for his solo exhibition at gallery 2. What will you see from the window? An office, perhaps a nice cozy office with a woman working at the desk. 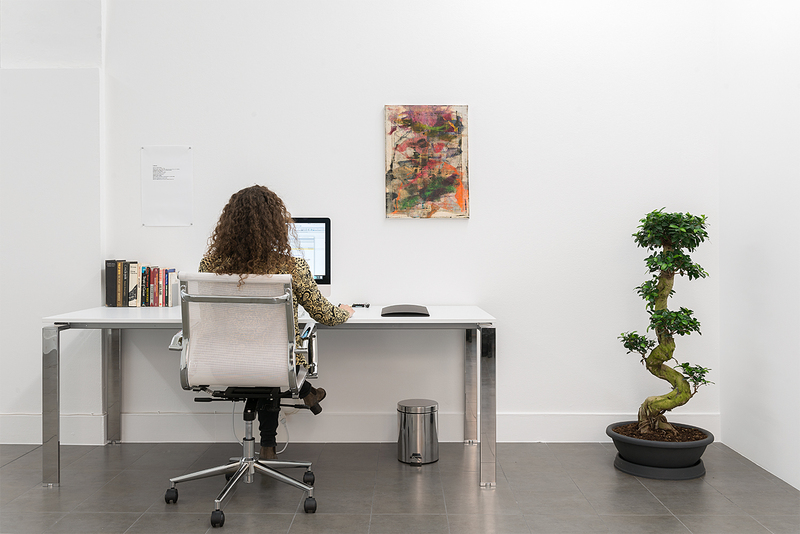 A nice desk, a plant, and some interesting abstract paintings. Who are the paintings by? They remind me of the abstract paintings by a young American artist I saw one year ago in this gallery, yet they were not so full of color and were a little less intense. The atmosphere is so clean and comfortable that I feel the need to sit down and enjoy it, but I can’t because there are no sofas in the room. Therefore I go further, I enter a second room, and here I finally realize I’m in a gallery. I am now confused but I like it: art without ambiguity is quite uninteresting. In this second room I find a table on which there are small boards, and on each of them is written a poem. 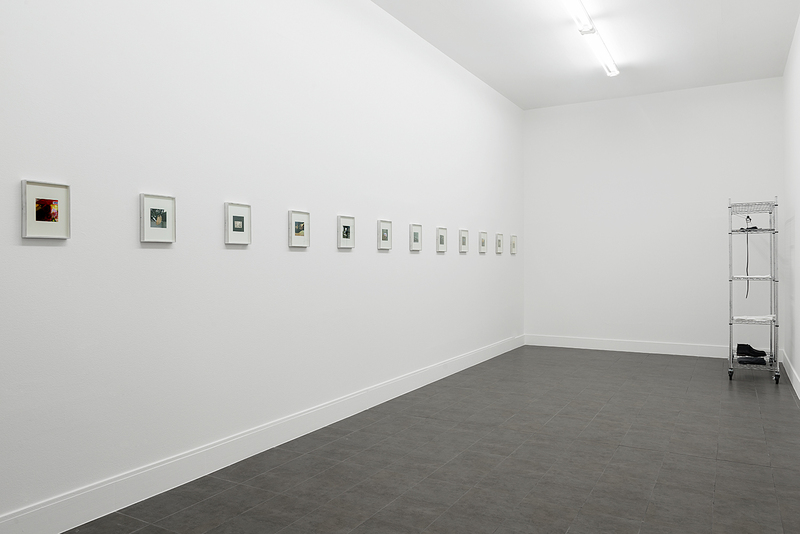 Various photographic images are on the wall beside them. 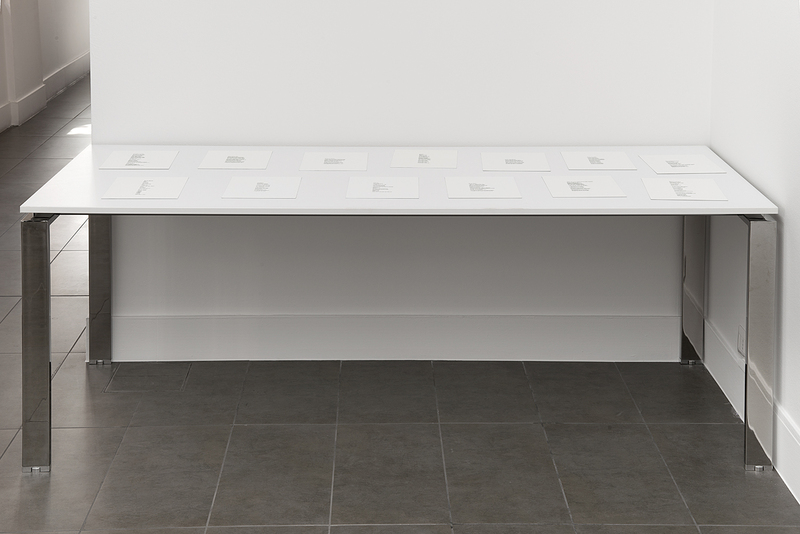 While I am looking at the poems I take a look into another private view of a gallery’s room. Is this room also part of the show? In any case, it fits very well with the sourroundings and could be interpreted as a “mirror appendix” to the first room. Varadi’s play is acute and wonderfully synthetic. I take a look at every photo and they seem linked to each other. It seems to be a progressive series, and I ask myself if the poems are also linked to each other. At the end of the photos series I take a look back, and I find an installation. 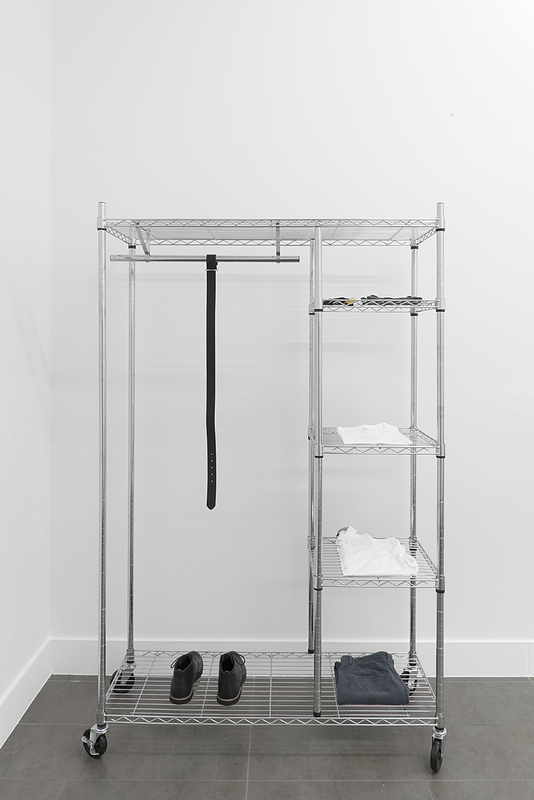 On a steel clothes hanger are a shirt, trousers, shoes and a belt… It is a very clinical, basic installation. The objects look somehow familiar. It is everything that Keith Varadi would normally wear. Almost. Look at it, and guess what Keith J. Varadi would never wear. Keith J. Varadi (b. 1985, Pittsburgh, PA) lives and works in Los Angeles, California.â He received an MFA from Virginia Commonwealth University and a BFA from Rutgers University. Varadi’s recent solo exhibitions include Badaude: Industry, Too at Retrospective, Hudson, NY; Nu Haiku at Smart Objects, Los Angeles, CA; Reader’s Digest at Sébastien Ricou, Brussels, BE; and Bear In Mind, Welcome Screen, London, UK. His work has and will be included in group shows at The Journal Gallery, Brooklyn, NY; LOYAL, Stockholm, SE; Johannes Vogt, New York, NY; Annarumma, Naples, IT; Primetime, Brooklyn, NY; and Stadium, New York, NY. He has curated exhibitions in New York, Los Angeles, Baltimore, Philadelphia, Mexico City, and elsewhere. His writing has appeared in Art in America, Prism of Reality, Kaleidoscope, Artfrum, artcritical, and WOW HUH. Maga Books will release a book of his poetry and photographs later this year.